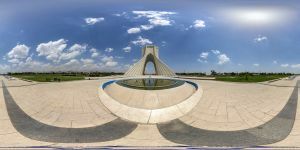 The Azadi Tower (Freedom Tower), previously known as the Shahyad, is the symbol of Tehran, the capital of Iran, and marks the west entrance to the city. 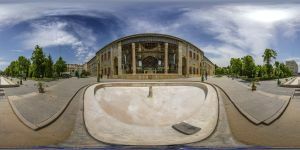 It is part of the Azadi cultural complex, located in Tehran's Azadi Square in an area of some 50,000 m². There are several fountains around the base of the tower and a museum underground. 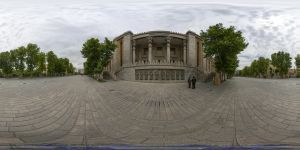 Tehran City Theater (opened ca. 1972) or Teatr-e Shahr is a performing arts complex in Tehran, Iran. Architect Ali Sardar Afkhami designed the main building in the 1960s, later expanded. 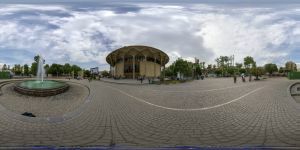 The complex contains several performance spaces including Chaharsou Hall, Qashqai Hall, Sayeh Hall, and the Main Hall. Sardar-e Bagh-e Melli (National Garden's Portal) or Meydan-e Mashgh was built in the Qajar period by direct order of Reza Shah Pahlavi. This portal was constructed as an entrance to the parade ground, owned by the army. 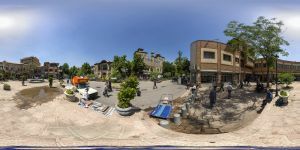 After building the gate, the idea of creating the first public garden of Tehran within the area of the parade ground was suggested and carried out. 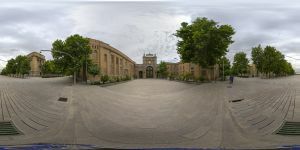 Thereafter, the Portal of the Parade Ground was called (The Portal of Bagh Melli). 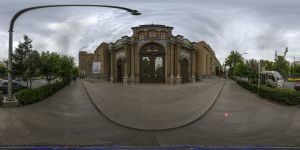 The public garden did not remain that long and numerous buildings like Ministry of Foreign Affairs, the National Library and the Museum of Ancient Iran was built within the area but the name of the gate remained Portal of National Garden. 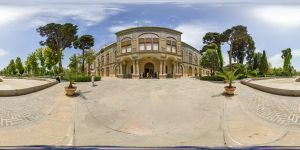 Bagh-e Melli (The National Garden) is a government compound where the Ministry of Foreign Affairs of Iran, The National Museum of Iran, Malek National Museum, and the future National Museum of Post are located. The compound is located in central Tehran. Emam Mosque (former Shah Mosque or Masjed-e Shah) located in the Tehran's Grand Bazar. 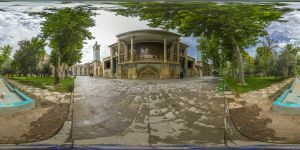 Meydan-e Azadi or former Shahyad . 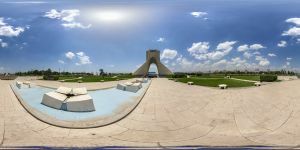 Built in 1971 in commemoration of the 2500th anniversary of the Persian Empire, this "Gateway into Iran" was named the Shahyad Tower, meaning "Kings' Memorial", but was dubbed Azadi (Freedom) after the Iranian Revolution of 1979. It is 50 meters (164 ft) tall and completely clad in cut marble. Built with white marble stone, there are eight thousand blocks of stone. The shape of each block was calculated by computer, and programmed to include all the instructions for the building's work. The inauguration took place on October 16, 1971. A Persepolis inspired modern building, the Ministry of Foreign Affairs in Tehran. A clear copy of the palaces in Persepolis with double ramped stair ways, portico in the center of the facade, high stone columns with double bullheaded capitals, stone reliefs of Persian guards with spear. A simpler and smaller version of how the Persepolis and Susa Apadana palaces could look like. 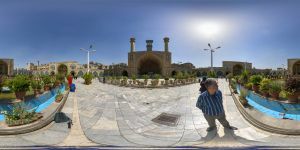 The ministry is in Bagh-e Melli (Meydan-e Mashgh) in Tehran.